WHAT: Mexican food without all the gimmicky hoopla and cheesy mariachi band. By keeping authentic ingredients and flavors, losing nacho cheese drenched food fillers, and adding the flashy flair of night out on the town, The Green Lemon has succeeded in modernizing Mexican without losing what makes the masses move toward the border. WHEN (To Go): Taco Tuesdays. At just $2 each, you can mix and match a line up of Lime Street Tacos – authentic corn tortillas with fillings that range from seasoned ground beef and crispy battered mahi mahi all the way to habanera shredded beef and avocado glazed buffalo chicken. It gets better. Coronas are just $2 bucks too. WHO (To Take With You): The friend that never wants to join you for Mexican because they are counting calories. While most Mexican options tend to weigh heavily on a weight watchers point index, The Green Lemon offers a variety of menu items – like Fiesta Bowls made with a base of fresh veggies, rotisserie meats, citrus jasmine rice and cabbage – for the calorie conscientious. WHY: Because the guacamole is fresh out of the avocado. 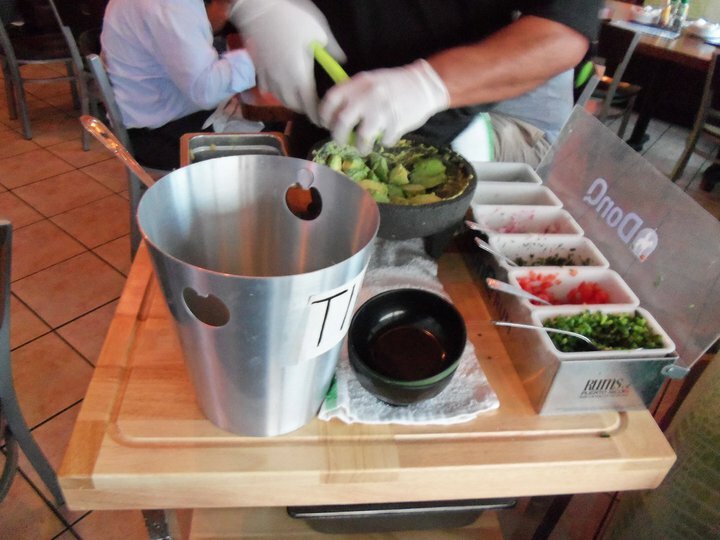 Order The Green Lemon’s guacamole appetizer and you don’t get a little dish of green stuff – you get a guac engineer who arrives to your tableside to prepare a fresh batch of chip dip, with your choice or fixings, just for you.